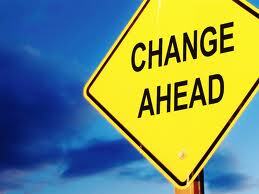 I recently heard a book title, called Change Before You Have To, By Rob Ketterling. I haven’t read it, but when I heard the title, the Lord impressed on me an urgent message for His people. I believe it’s a message filled with mercy and provides hope, though this may initially sound like doom and gloom. Imagine with me for a moment…. The economy comes tumbling down. It could be from the financial cliff finally caving in, a terrorist attack or even a natural disaster? What if our President is impeached or Martial Law is called. What if our country is at a complete stand still. Banks close their doors and tell you that you cannot have access to your money. What if pharmacies tell you that you can’t refill your medications, because the government is regulating this through hospitals. Now only life threatening emergencies would be treated for now on. What if you had no access to buy food or supplies? I heard that after 9/11, Homeland Security told all food and supply stores that for all future emergencies, they might be asked to close their doors immediately. That they would not be allowed to sell anything further to the public. The purpose for this is because FEMA may be called in to ration what’s left. I wasn’t able to verify this if true, but what if it is? Ok, maybe this picture seems a little exaggerated for our country, but let’s pretend for a moment that it’s not. What would you do? How would you react? Would you be prepared for this type of crisis? And if not, how can you get prepared? Or are you like most and believe that tragedy won’t happen to you? I’m sure the folks in Joplin, MO a few years ago didn’t suspect a F5 tornado would wipe their town out. I’m sure that those in New Orleans didn’t expect the mass devastation that Hurricane Katrina caused? I believe the Lord showed me four main areas that are critical in this hour. I’m not able to go in as much depth as I’d like to but will touch on the hot points. 1 – We need to know God as our Provider! If you lost your job today and you had little to no money in the bank, would you believe that God would make sure you had food and shelter, that he could pay your bills? God wants us to know that He is our provider. If we follow Him and are obedient to what He asks of us, the bible is clear. He will provide for our all our needs according to His riches. Matthew 6 says “That is why I tell you not to worry about everyday life—whether you have enough food and drink, or enough clothes to wear. Isn’t life more than food, and your body more than clothing? Look at the birds. They don’t plant or harvest or store food in barns, for your heavenly Father feeds them. And aren’t you far more valuable to him than they are?" Almost two years ago, in obedience to the Lord, my husband quit his job of 26 years. This left us with no income. Our assets were nearly depleted. God asked us to trust Him and believe that He would meet our needs. The Lord even asked us to continue tithing a certain dollar amount and give beyond the tithe when He led. In the natural, this often did not make sense, but we were obedient. Let me share a quick story. Not long ago, our house payment was due, it was the 11th hour. I asked Ken how much money we had left in the bank and he said about $250. I told him that I thought the Lord wanted us to give $200 away to a ministry. Ken sensed the same, so we got the check written and sent it off. Two days later we were having coffee with some friends and they asked us to go to their bank with them. They handed us a cashier’s check for the amount of our house payment. God is faithful! Faith pleases Him. When you trust Him even when things seem impossible, He is with you and He will provide! 2nd – God wants us to be in good health! We need to be changing our eating habits? As believers, we are not our own, we were bought with a price, the precious blood of Jesus. How many times have you put something in your mouth and regretted it? Or gone for fast food or you just plain ate until you were miserably full? I know I’m guilty of this more times than I can count. Do you know that what you put in our mouth can change the quality of life you live. As Americans, we are consumed with a microwave mentality. We want it and we want it now. Fast Food, processed ready made meals, snacks and sweets. We have evolved from good wholesome, nutritious meals and quality family time around the dinner table, to drive thru’s and superficial conversations. God gave us this land so we could eat from it and He designed our bodies to heal themselves if we take care of them. One thing I believe He wants us to do is to grow our own gardens or at least buy from the local farmers who don’t inject their chicken or livestock with hormones OR who don’t spray their crops with chemical pesticides. At some point in the future, this may be our only source of food. Many of us have chronic health conditions. Not all, but most health issues are due to the type of foods we eat or from side effects from the drugs we take. Remember my make believe story earlier on? What if the hospitals only treated those with LIFE-threatening illnesses. Too bad if you have chronic pain or sickness. If it’s not killing you right then, you’ll just have to deal with it. Do you know that Obamacare can dictate who gets health care and who doesn’t? I’ve been doing much research over the past few years on how to treat different health issues with natural remedies or supplements versus prescription drugs. For example, I am using Red Tart Cherry Juice for osteo-arthritis with much relief. If we do the research now, we can learn what foods or herbs can help us and heal us. 3 – God wants us in community with each other! How many of us pull into our garages and shut our doors down? Could you count on your neighbor if you had nothing. Would they support you and your family, provide you with meals and other needs until you were back on your feet? God desires us and, designed us to have real and authentic relationship with Him and each other! The early church in the book of Acts shows us how: They devoted themselves to the apostles’ teaching and to fellowship, to the breaking of bread and to prayer. Everyone was filled with awe at the many wonders and signs performed by the apostles. All the believers were together and had everything in common. They sold property and possessions to give to anyone who had need. Every day they continued to meet together in the temple courts. They broke bread in their homes and ate together with glad and sincere hearts, praising God and enjoying the favor of all the people. And the Lord added to their number daily those who were being saved. Be honest, would you be willing to sell your possessions to help someone in need? Are you willing to be go beyond superficial and move into real and authentic relationships? I recommend you watch an old tv show, Little House on the Prairie and study the way the family unit and the community interacted. The family prayed together and trusted in God to come through. If someone had need, the entire community would pull their resources and together help them out. They humbled themselves to be dependent on others and to be reliable and generous. Several years ago, the Lord showed me that one day we would return to these foundations. I don’t know if He meant it literally or just in the sense of community. If it’s literal, probably many of us wouldn’t survive. When God tells us to make changes in our lives, He is not doing so because He wants to see us suffer or necessarily go without. He is asking us to make changes, to prepare us for what’s ahead. He is showing us mercy and compassion. Let me ask you this, have you gone through a rough patch in your life and felt you were all alone? A quote we all know is "When you’re up, your friends know who you are, but when you’re down, you know who your friends are?" Ken and I have experienced this first hand in the past year or so. It's not surprising, but it's sad. Everyone must have at least one person they can they rely on to encourage and bring hope, a friend who can see them through anything. 4 – Relationship with Jesus Christ! The most important thing we can do is to have a deep and intimate relationship with Jesus Christ. God must be at the center of everything. How do you do that? Here’s a few ways I know. 1. Spend as much time as you can each day in His Word. Ask the Lord to bring revelation to you and to give you an insatiable hunger for His Word. In order to be a light, we need to live in the light of God’s Truths. 2. We need to pray – pray without ceasing for everyone and everything. PRAY! 3. We need to spend time in worship & praise and giving thanks to the Lord for all He has done in our lives. Thank Him for how much He is doing and how much He will do. He is worthy of all praise!! 4. We need to put the needs of others before our own. Selfishness and self-centeredness is rampant everywhere. We can express God’s love best when we care and help others. IF we want God’s blessings, protection and provision, change must start with us individually. Our society has become rebellious in that we defy the laws of God. Being obedient to the Lord has become just an option, not a requirement. Obedience needs to apply to every area of our lives and everything God asks of us. Deception was the original sin in the garden and it still continues today. If we violate God’s laws, there are and will be consequences. In John 15 it says if we abide in Him, He will abide in us….but apart from Him, we can do nothing! If you don’t have a relationship with Jesus, now is the time to say yes to Him. Tomorrow may be too late. Genesis tells us that God created man in his own image, in the image of God he created him; male and female he created them. He created us with a desire to know Him and have relationship with Him. Often we try to fill that hole or that void with things, or people or unhealthy addictions, but the only one who can really bring that satisfaction is God. Accepting Jesus is NOT a religion, it’s a relationship. When you feel all alone and your friends have disappeared, God will never leave you nor forsake you. He is your always- faithful friend. When you are hurting, He is your hope. When you are going through trials, He gives you peace. He is your source of all comfort. When my husband and I gave our lives to Christ. We surrendered our will to His ways. We learned that He is in control and He owns it all. We have been fortunate to have time to practice listening to His voice and making some of the necessary adjustments He has asked of us. These years has been very difficult at times, even right now. However, we are thankful that God in His mercy is teaching us daily how to trust Him, to realize He is faithful and know that He cares for us and our every need. Jack Welch, a successful business man said “Never be happy where you are”. Meaning, we are not to be satisfied. We are to continuously learn, grow and change. My recommendation - Change, before you have to! Change before your forced to. The longer you wait, the harder it will be. The Lord is asking us to wake up. He is preparing His people for the day He returns. Let those who have ears to hear, let them hear. Joni Ames is coming back to town 3/7-3/24. Joni is an itinerant prophetic minister & teacher. www.joniames.com. If you are interested in hosting her in your home or in your church, please contact me at michele@wantinsight.com. We are hosting her 3/12 and 3/20 and may have some seats available. Please let me know if interested in attending. Dave Doria will be here - date to be determined yet. He is an amazing teacher - teaches on Grace, the Person of Jesus Christ and the finished work of the cross.